Not only did NBC News chief foreign affairs correspondent Andrea Mitchell get to ask the final question during President Obama‘s joint press conference with Cuban president Raúl Castro, she earned a glowing compliment from POTUS in the process. Andrea, the embargo is going to end. When, I can’t be entirely sure, but I believe it will end and the path that we’re on will continue beyond my administration. The reason is logic. The reason is that what we did for 50 years did not serve our interests or the interests of the Cuban people. And as I’ve said when we made the announcement about normalizations, if you keep on doing something over and over again, for 50 years and it doesn’t work, it might make sense to try something new. And that’s what we’ve done. 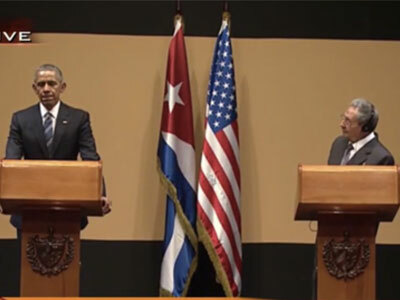 Obama cited two major changes that would bring about the end of the embargo. The first, the opening of legal opportunities for U.S. businesses to invest in Cuban infrastructure projects. The second was human rights itself, and here Obama compared the legitimacy of opening up relations with Cuba to the U.S. engaging with other countries that have questionable human rights records like China, Vietnam and Burma. The approach that I’ve taken is if I engage, frankly, clearly, stating what our beliefs are but also being clear that we can’t force change on any particular country, ultimately it happens from within—then that is going to be a more useful strategy that the same kinds of rigid disengagement that for 50 years did nothing. I guess what this comes down to is I have faith in people. I think that if you meet Cubans here, and Cubans meet Americans, and they’re meeting, talking, and interacting and doing business together and going to school together and learning from each other, then they’ll recognize people are people. And in that context, I believe change will occur. Well, Andrea … there are 61 international instruments recognized. How many comply with all the human rights and civil rights that have been included in these 61 instruments? What country complies with them all? Do you know how many? I do. None. None whatsoever. Some countries apply with some rights, some with others, and we are among these countries. Out of the 61 instruments, Cuba has complied with 47 of these human rights instruments. There are countries that comply with more, some that comply with less. I do not think human rights should be politicized. That is not correct. If that is the purpose than we will stay the same way. Do you think there is any more sacred right than the right to health? We’re not sure what instruments Castro was referring to. We might have assumed, perhaps, the UN’s Universal Declaration on Human Rights, but that document contains 30 articles. We’ll update when we get more clarity. Castro did close that stream of thought with a more positive note. “But let us work so that we can all comply with all human rights,” he said.